In a small bowl, soak the dried chipotle and Anaheim chiles in hot water for 20-30 minutes to rehydrate. Meanwhile, sprinkle flour on a plate, dredge beef in flour. In a large, deep saucepan, heat oil. Add beef and brown. Add onions, garlic, habanero and celery, cook about 5 minutes or until the vegetables are soft. Drain and puree the rehydrated chiles. Add the beer, stock, tomatoes, chili powder, cumin, oregano, orange juice and chile puree. Bring to a boil, reduce heat and cook 45 minutes, stirring occasionally. 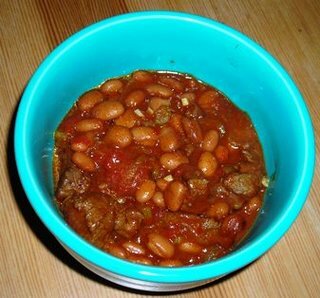 Add pinto beans and cook an additional 25 minutes, stirring occasionally. An easy, hearty chili that's good served over corn bread, tortilla chips or saltines.